All this time I thought that Bill was sort of normal, but it turns out he's exactly like the rest of my family. Maybe that's why I was attracted to him in the first place -- the familiarity and all. Anyway, I told him about my sister Jenn's obsession with Bertram's wardrobe, and instead of laughing along with me, like, "Ha, ha, ha, isn't she weird," he tells me to dress Bertram up in a golf outfit like Payne Stewart! Maybe Bill's only saying this because he's so weird about golf and is otherwise normal. 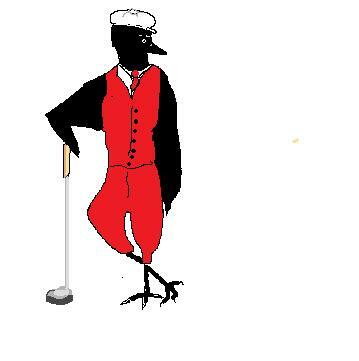 Anyway, Bill is sick in bed tonight, so I thought I would cheer him up a bit and made a picture of how Bertram would look dressed up like Payne Stewart. Here you go, Love. Now Bertie can go golfing with you.